Night School, the racing industry’s national online fan education program, takes its annual look at the Kentucky Derby and Oaks with an in-depth handicapping seminar tonight. Week 9 of the season features a 90-minute live chat with the experts, beginning at 8:30 p.m. ET. More than a half-dozen nationally recognized handicappers will appear either live in the chat or via audio streaming reports. Fans attending Night School will receive final-version, free Kentucky Oaks past performances from BRIS, the official past performance provider to Night School. This week’s study materials include the post times and wagering format for Oaks and Derby Days at Churchill Downs. To help with the Oaks and Derby Day handicapping Night School host and Countdown to the Crown author Jeremy Plonk will be joined by Ed DeRosa of BRIS, and the Night School “Dean” Jerry Shottenkirk. Regional handicapping reports on audio will be featured along with the fans’ Q&As on contenders. Those appearing in reports include Jon White of Santa Anita and HRTV; Michael Beychok, DRF-NTRA National Handicapping Champion; Pete Denk, handicapper, journalist and contributor to the Thomas Herding Technique; Molly Jo Rosen of Bet America; and Jonathan Fowler of Keeneland Select; and Brian W. Spencer of Fair Grounds and Horse Player NOW. The session also will feature Jill Byrne’s Backstretch Buzz videos, courtesy of Kentuckyderby.com. Presenting title sponsors for Night School 2014 are the National Thoroughbred Racing Association, American Quarter Horse Association, Keeneland Select, Twinspires.com, The Stronach Group, Mountaineer Casino, Racetrack and Resort, Betamerica.com and Woodbine Entertainment. Students who wish to attend Night School can do so by logging on to any one of more than 40 websites throughout the racing industry that simulcasts the weekly online tutorials. There is no advance registration or sign-up required. 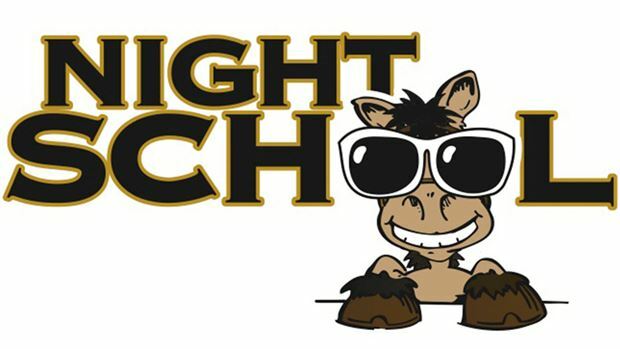 This week’s Night School will be followed at 10:00 p.m. (ET) by the “After Night School Special,” featuring live racing from Mountaineer Park. The segment will cover the evening’s final race in real time with free, live-streaming video. Fans wishing to take part in the Mountaineer action simply need to remain in the Night School chat after class. Complimentary past performances are available, courtesy of BRIS.